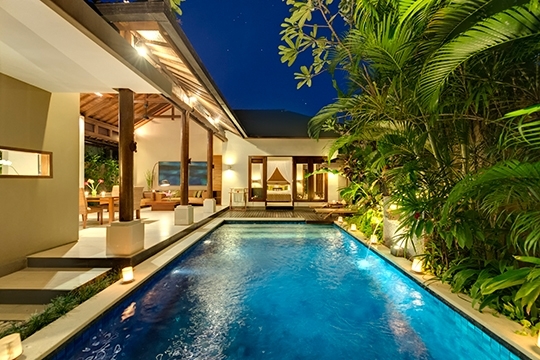 The one-bedroom, fully staffed, Villa Solo, complete with a private swimming pool, is a small, yet romantic, tropical oasis in the heart of Seminyak’s ‘Golden Triangle’. 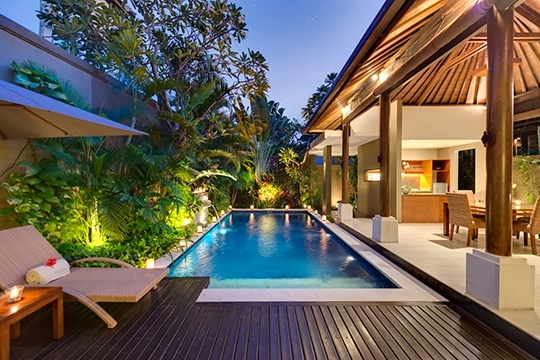 Ideal for couples, it is part of a four-villa enclave, set within the luxurious Laksmana Enclave private estate, just minutes away from the beach. 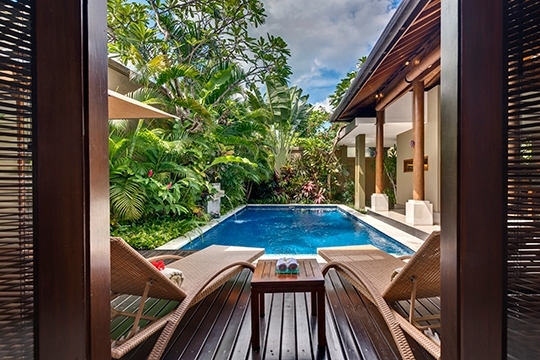 An historic 1-bedroom dwelling in an enchanted tropical garden, Villa Radha comes with all the comforts of modern-day living, including personal butler service, private swimming pool, and spa. 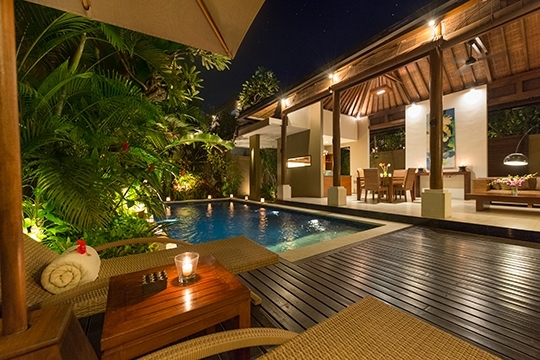 Located near the coastal village of Canggu, it offers one of the most romantic and unique villa experiences in Bali. If you’re looking for affordable privacy, just 500m from Seminyak Beach in one of the classiest, most happening neighbourhoods in Bali, then Villa Solo is the villa for you. Offering so much more than a hotel room of comparable price, the single-storey, one-bedroom property is comprised of two pavilions and a swimming pool enclosed within a walled courtyard. 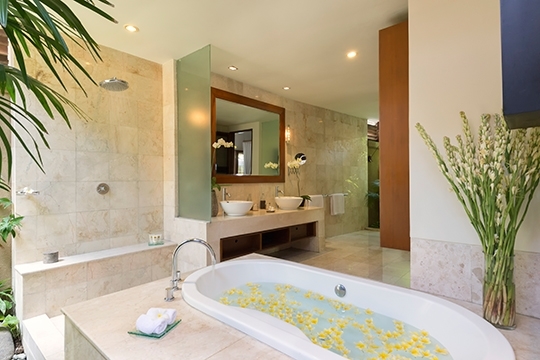 The décor is immaculate, the furnishings are high quality and the romantic open-air bathroom is a delight. Ideal for couples, this cosy little pad presents a real flavour of tropical poolside living, completely self-contained, very secure, and very conveniently located. The beach, the best choice of international restaurants on the island, a range of chic boutiques and a vibrant nightlife are all within walking distance, but when you want to escape from the rest of the world, you can close the door and enjoy some total privacy. Here, you can go skinny dipping in the pool safe in the knowledge that no one can see you. Villa Solo blends modern Balinese architecture with local materials, an elegant décor, sumptuous fabrics and imported fixtures and fittings. The contemporary style embraces a clever use of space, while honouring the artistic heritage of Bali with colourful artwork and interesting artefacts. 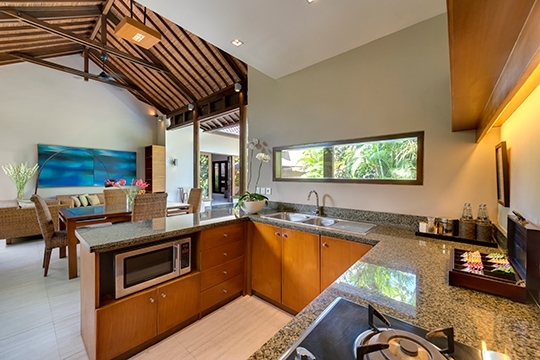 The living & dining pavilion incorporates a small kitchen, designed to supplement the on-site, full service master kitchen, while the sleeping pavilion contains a spacious bedroom complete with a study/sitting area and a large and open ensuite bathroom. 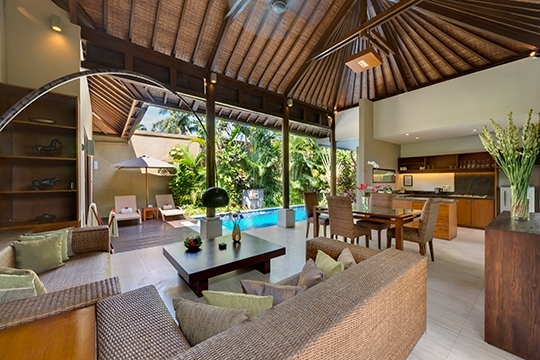 A full team of staff including butler, chef, housekeeper and security, serve Villa Solo under the supervision of a villa manager who can also arrange in-room spa services. 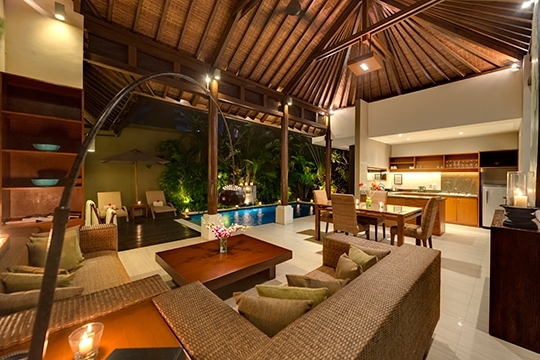 Balinese cooking classes can also be arranged in the privacy of Villa Solo under the guidance of the Lakshmi Villas chef. Meals can be ordered from an à la carte fixed price menu or self-catered with the chef purchasing provisions (on guest account). WiFi is complimentary. The villa is perfect for a couple. 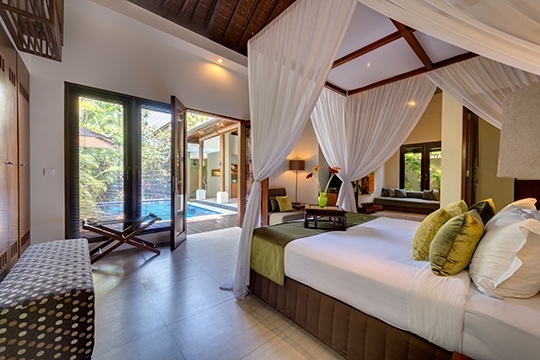 Alternatively, an interconnecting door to two-bedroomed Villa Kawi presents guests with a three-bedroom renting option. For larger groups, all four Lakshmi Villas (Solo, Kawi, Ubud and Toba), plus a one-bedroom apartment, can be rented as a block, accommodating sixteen adults. Simple, stylish, modern, practical, immaculate and private. Villa Solo is nestled within the luxurious and secure Laksmana Enclave in Petitenget and has great access to the area’s many facilities. Walking 250m down the driveway will bring you to several nice coffee shops, boutiques and affordable restaurants. Five-star hotels with fine-dining restaurants line the opposite side of the road. By turning right you can access the beach (500m) at Petitenget Temple. Here you will also find the beachfront La Lucciola – great food and one of the best restaurant views on the island. Be sure to check out Bodyworks Spa (300m) too; a favourite with expats. When you turn left from the driveway a row of shops will lead you to the famous beachfront dining and lounge venue, Ku De Ta. A whole slew of great restaurants and nightspots can be found in either direction within two kilometres of the villa. Taxis are reliable, cheap and plentiful. Villa Solo’s open-sided living and dining pavilion features a soaring roof supported by coconut wood pillars above a cool terrazzo floor. Ceiling fans and gentle breezes keep this area cool, and bamboo blinds can be dropped for shade. 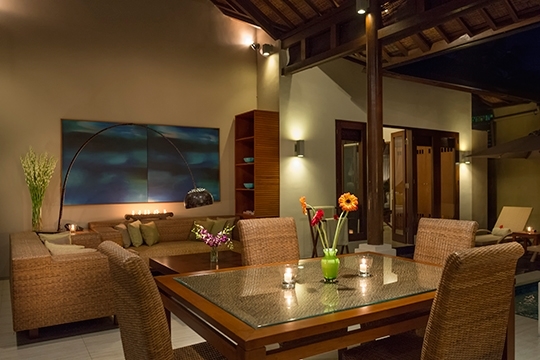 The pavilion is tastefully furnished with a cushioned rattan lounge suite, a coffee table and a dining table for four. Adjacent to the dining area is an open-plan kitchen equipped with a two-burner gas hob, a refrigerator, a microwave, and a good range of glasses and utensils. Accessed by full length glass doors, the air-conditioned bedroom is furnished with a canopied king size bed, large comfy chairs, table lamps, a teak desk, and a wardrobe, and equipped with a 31-inch, LCD, satellite channel TV, a DVD/CD player, a safe deposit box, and a telephone. The olive décor is complemented by rich fabrics in co-coordinating tones of olive and brown. The study/sitting area is furnished with a cushioned daybed, desk and chair. The ensuite open-air bathroom features marble walls and glass partitions. Planted with yucca palms, it is fitted with a terrazzo vanity unit, ‘his and hers’ washbasins, a walk-in rain shower, a bathtub for two, and a toilet hidden in an alcove. The 6m swimming pool borders the living and dining area. A small timber poolside sun deck is furnished with two loungers and an umbrella and equipped with a barbecue. Stone-carved waterspouts provide the serene and constant sound of running water, and the high walls are bordered by flowering shrubs, two frangipani trees and a traveller’s palm. Rates apply to 2 adults and 1 child. 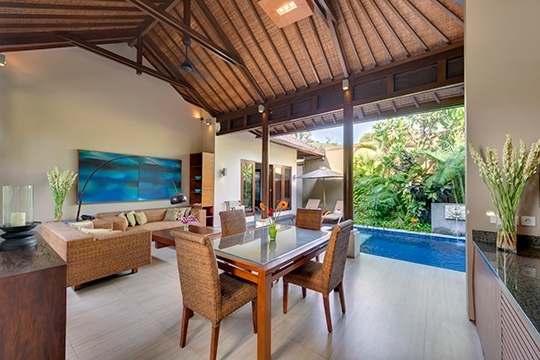 1 bedroom villa located in Seminyak, Bali. Ideal for Beach in ten, Body and soul, Romantic retreats, Sensible for seniors, Walk into town, City Scene. 8 out of 10 based on 86 user reviews.